Viking Squad is a co-op action rpg that invites players to pillage and plunder their way through voyages that are never the same twice! 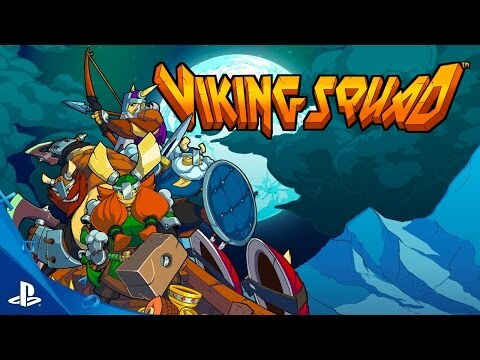 Viking Squad sails you into an action packed brawler with strange monsters, dangerous foes, and walrus rides! Play with your friends on a couch or on-line and battle through bizarre areas to gather massive treasures, gold, and glory. Outfit your Vikings with powerful equipment you find on your travels to help free your Jarl from Loki’s evil control and bring balance back to your realm. The distinct lane system in Viking Squad keeps your attacks and movements in check as combat precision plays an important role in proving your might. Bash through bosses and unlock hidden areas with your pals in this classic arcade experience! Up for protecting your pals and freezing your foes? The Shield sporting raid veteran has seen many frays and knows that nothing beats blocking bad guys and bashing brigands. Armed with a sword and shield; the Blue Viking brings the powerful force of the very blizzards to bear on foes while offering his team defensive cover. Choose the Shield Viking with his trusty blocker and sword and unleash a frozen fury on your enemies! Feel like swinging hammers and shaking things up? The Hammer Maiden trains the hardest out of our group and brings that intensity to her combat style with powerful ground stomps and massive knock-back attacks. Wielding a weighty weapon and mighty pigtails; the Green Maiden engages in earth-shattering strikes and seismic stomps. Choose the Hammer Maiden to unleash earthquakes on all who oppose you! Angry and like Axes? The Hatchet Viking tears into combat with a berserker's fury and flames on his heels. Dual-wielding axes; The Orange Viking blazes into battle with fiery charges and focused flame attacks with little regard for his personal safety. Pick up the Axe Viking for some volcanic violence and chaotic chops! Are you a thinking man’s Viking? The Bow Viking has been around the longest and understands the importance of a ranged encounter and a fast dagger strike. Bringing a bow to battle; the Purple Viking fires electronic carnage into assailants with a lightning charge that leaves enemies in shock. Give the Bow Viking a shot if you are after experienced precision and ranged rampages! Local and Online Co-op with up to 3 players. Find new weapons and gear to level up each character. Each playable character has their own signature weapon changing the way they approach combat. 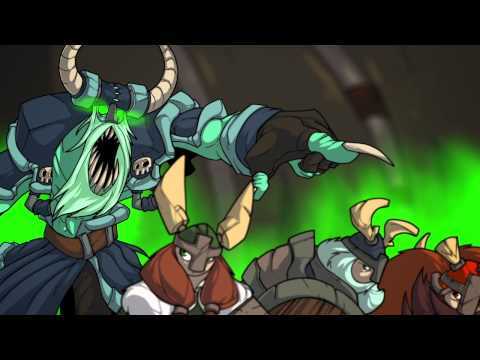 Lane based brawling with precise and intense combat system. The Gods guide your voyage: By worshipping each god new opportunities and perils are unveiled. Striking hand-drawn 2d art style, courtesy of Jesse 'the Drawbarian' Turner. Sound by Power Up Audio, Music by A Shell In The Pit.